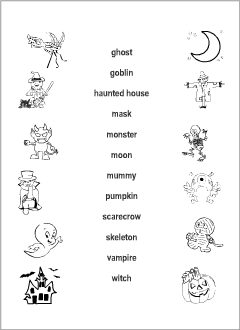 Here, in one place, you can browse, download and print worksheets designed for learning and practising English words related to the theme Halloween: ghost, haunted house, mask, monster, mummy, pumpkin, scarecrow, skeleton, vampire, witch. Scroll down to explore! Take a look at the previews to see which ones are best for you and your students! Each resource image is a direct link to the pdf file. All worksheets, except Bingo! cards and Flashcards, have corresponding answer sheets, listed in the seperate boxes. Here you can browse our word games only. View worksheet images, learn handy details about each of them, then download and print the resources you are interested in. There are also links to the related online activities, and tips on how to use. Here you will find a guide to the picture tests and vocabulary quizzes. This guide provides materials to download and print, as well as resource previews, short descriptions and links to the related online activities. There are ten different activities in the set. Simply click the resource image you are interested in and print your worksheet. For answer sheets use the links listed in the separate boxes. Choose from five different types of worksheets designed to learn and practise English vocabulary related to the theme Halloween. Below you can view worksheet images, learn handy details about each of them, then download and print the resources you are interested in. 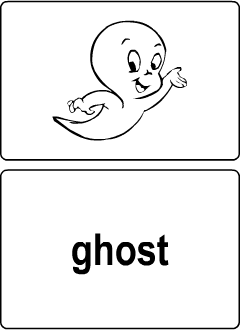 There are ten vocabulary words that appear in our printable Halloween word games: ghost, haunted house, mask, monster, mummy, pumpkin, scarecrow, skeleton, vampire, witch. Not all word games have all of these words. Mostly, there are nine vocabulary words in each worksheet, except our flashcards that cover all the vocabulary for the unit. In the regular crossword we use definitions as clues. You can find the definitions for each word on the following pages: wordlist and picture dictionary. 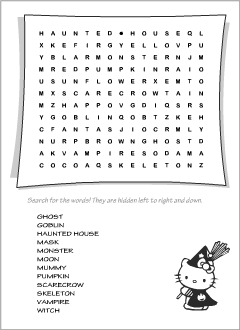 Choose from five different types of worksheets designed to consolidate and revise English vocabulary related to the theme Halloween. 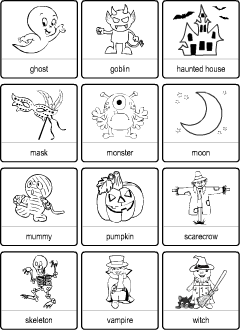 There are ten vocabulary words that appear in our printable Halloween tests and quizzes: ghost, haunted house, mask, monster, mummy, pumpkin, scarecrow, skeleton, vampire, witch. Our vocabulary quiz has ten questions (definitions), each with four possible answers (words). You can find the definitions for each word on the following pages: wordlist and picture dictionary.